The Marco Island fleet welcomed 32 skippers representing 10 states and Canada and the Bahamas to the oldest running RC Laser regatta in the country. Our regatta hosts, MaryLee and Rocky Cale spent many months in preparation for this perfectly executed regatta. Practice racing on Friday was very casual with old friends catching up and welcoming new sailors to the regatta. The group met for dinner that night at a local restaurant for a fun social night. Saturday’s racing was started after Race Director, Dave Brawner gave out race instructions along with his infamous “boys and toys” speech to set the mood for the regatta. The first day of sailing uses the ODD/EVEN system which separates the fleet into Gold and Silver for the second days’ races. Winds were light and shifty with all sailors using A sails. By the end of day one the top 5 boats going into Gold fleet were Dave Ramos, Rob Seidelmann, Jamey Betz, Jim Kaighin and Bill Bentz. 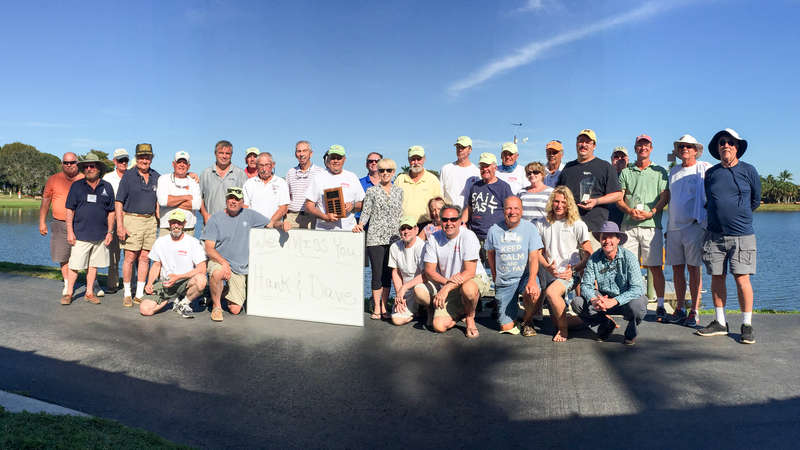 The Silver fleet leaders were Larry Lefczik, Cape May Ray, Richard Flach, Jim Meyers and Joan Lefczik. The entire group met at a Marco sailors’ favorite restaurant, Konrads, for an enjoyable evening of good food and fun. Sunday’s Gold and Silver fleet racing started with fresh winds using B sails and as the winds softened during the day the fleets switched over to A sails. The racing was split up with each fleet sailing 2 races at a time with the Gold fleet sailing a total of 9 races and Silver fleet sailing 8 races for the day. Congratulations to the top sailors in the Gold fleet: Dave Ramos, Jim Kaighin, Rob Seidelmann, Jensen McTighe and Jamey Betz. A special congratulations to Jensen McTighe—by far the youngest sailor—who had just started sailing RC Lasers a month prior and this was his first regatta. He had 2 firsts in Gold fleet racing Sunday. Congratulations to the trophy winners in the Silver fleet: Henry DeWolf, Harry Henkel and Jim Meyers, and to the top woman sailor, Joan Lefczik, who finished tenth. During the weekend there were 2 raffles; MaryLee rounded up some very nice raffle items including donated sails, a gift certificate from the local hobby store, RC shirts, miscellaneous sailing items for the men and for the women a beach bag donated by Lisa Brawner and a sterling silver sailboat necklace made by Beth Lippincott. The other raffle was a factory field tested RC Laser donated by Jim Meyers of Intesnsity Sails which was won by Roger Baldwin of Easton, MD. A special thanks go out to all who helped with this regatta, and for those perfectly run races, Dave Brawner, Dave Dumas, Harvey Spriggs, and MaryLee Cale.